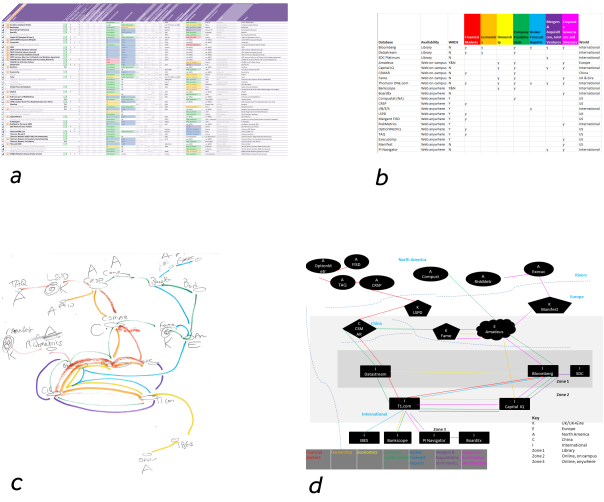 At The University of Manchester Library we subscribe to many database resources, containing vast amounts of structured data, organised by further descriptive or meta data. These descriptions can be considered as many dimensions or variables, and it is important to focus on just a few to begin with. Many research students frequently need to consult our large and rich selection of specialist business and financial databases to collect data and to shape their studies. There are over fifty databases that I would consider particularly relevant to that field, which are also of interest to a wider audience. It would be beneficial to these new researchers to have a better way to begin to answer these queries quickly, saving potential hours of trawling through the wrong resource. I will explain the process I took to planning and constructing this diagram below, but first I will briefly explain what it shows. 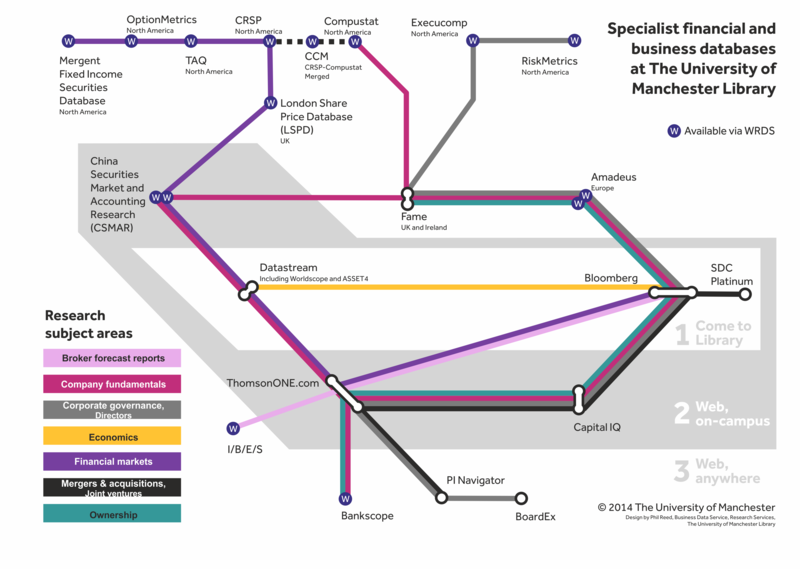 Seven research areas that require the use of specialist financial and business databases are represented as tube lines. The viewer can follow each of these lines through the various database products, which are shown as stations. The places where researchers must be to use each database are shown as zones. Access location (in the Library or through the web). Type of data provided (numerical, reports). These seven questions still only scratch the surface when choosing a business data source, but it is a start. I had already created a table with a list of the 50-plus relevant databases and columns for each of those factors (Figure a) which I used to gain a better understanding of the resources I work with when I came into post. I worked with my colleague Xia Hong to reduce this table to the 21 most important databases and the three most important factors listed above (Figure b). The research areas were marked against databases just as yes or no matches, preparing for a decision of which lines will go through which station. I decided to use good old pen and paper when it came to drawing out the layout. (See Figure c.) Network building software exists but I decided that the learning curve for these would be too steep for the benefits, since the hand-drawn approach worked for me. I started with the database that matched the most research areas (ThomsonONE.com) and drew outwards from there. Next, I entered the structure into PowerPoint, as it was the fastest tool available that I knew how to use (Figure d). This clearer format was used for checking the content for accuracy and omissions. The layout of the objects was refined in this tool, before employing CorelDRAW for the final markup. Position: the very top is North American coverage, the left China, above the middle is Europe, and the rest is international. Sadly, there is no river, which I could have used to separate North America from the other continents! This diagram is busy enough that no more information could be added without compromising its readability. There is more information on the Library website subject guide page covering these databases, which is the first port of call for a student enquiry. After that, all current students and staff of The University of Manchester are welcome to attend a research consultation session, where an expert from the Research Services team will be available. It is difficult to convey lots of structured information. If we focus on just the initial or most important factors, we can produce something that is helpful and appealing. See also earlier post: Why are there so many business databases? Reblogged this on Business Research Plus.